Your financial plan should encompass your complete financial picture, including your goals and priorities. It should include planning for your children, your spouse, aging parents, long-term care, death, loss of income, and so much more. But just because these things should be included in your plan doesn't mean your adviser is automatically doing so. Here are five key things your financial adviser may ignore or omit telling you. The term financial adviser is becoming increasingly ambiguous. Due to the complex rules that determine who can call themselves a "financial adviser," many professionals who are unqualified to give financial advice are unfairly operating under this label. Benjamin Brandt, a North Dakota financial adviser and host of the podcast Retirement Starts Today Radio, recommends that you only take advice from and follow a financial plan created by a qualified fee-only financial fiduciary. Fee-only fiduciaries are paid a flat fee that ensures they don't earn commissions on investment sales. Since they don't depend on commissions from sales, you won't have to question whether a fiduciary adviser is operating with your best interest at heart. Understanding your complete financial picture — including where you are currently and your future aspirations — is key in developing a true financial plan that is beneficial. According to Brandt, if a financial adviser shows you a glossy sales brochure and offers you investment products before ever looking at your budget, net worth statement, or written financial goals, you are not working with a fiduciary and should ignore his or her financial advice. 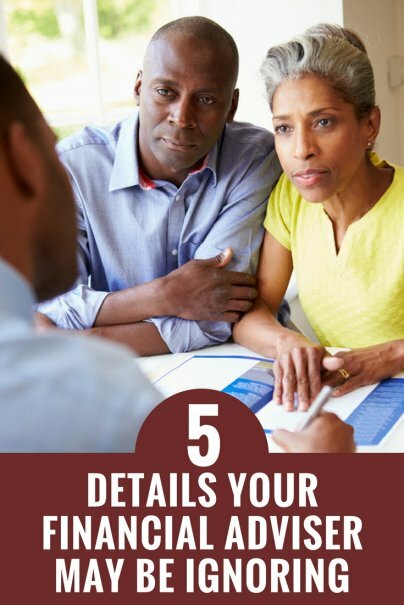 Before sitting down with an adviser, it helps to take a good look at your finances. Things like calculating your net worth, setting your financial goals, and creating an informal budget before your first visit with an adviser can help you start off on the right foot. A financial adviser who fails to ask about your financial goals as it relates to your children, your spouse, and your lifestyle is doing you an injustice. An adviser who merely wants to sell and manage your investments can actually set you up to lose more money long-term than if they include your financial priorities in the plan up front. Take, for example, a parent who wants to send their children to school without student loans. That parent would need to explore options that help in saving specifically for college. This could be done through traditional methods or less conventional saving vehicles such as a 529 plan. There are many factors that can shape that decision and a good financial adviser should work with that parent to determine the best savings vehicle to suit the needs of that family. If you are working to reduce or eliminate debt. Your plans for one-time expenses such as paying for a wedding or taking a large vacation. Education planning for you or your children (private school, college, continuing education programs, or advanced degrees). A possible career change by you or your spouse. If you are planning to start a business. According to LongTermCare.gov, 70 percent of people turning 65 will require long-term care services sometime in their lives. And of that number, the U.S. Department of Health and Human Services found that 18 percent will have to live in a long-term care facility. According to insurance firm Genworth, the average annual cost of a stay in an assisted living facility is $45,000, while a stay in a nursing home with a private room costs an average $97,455 per year. And avoiding a stay in a facility isn't necessarily the answer to saving money on long-term care; an individual receiving 44 hours of in-home health care weekly can expect to pay close to $50,000 per year. Long-term care services come with significant costs that often impact retirement plans, savings and assets, and the level of care one receives. If your adviser doesn't account for these expenses in your financial plan, they are putting you at risk of financial turmoil later in life. This means that for some, considering their age, family history, and potential health risks, a health savings account (HSA) may make more sense than a traditional IRA. With a traditional IRA, you contribute pretax dollars to the plan and the money grows tax-deferred. You pay taxes when you withdraw the money when you retire. To enroll in an HSA, you must have a high-deductible health insurance plan (HDHP). With an HSA, you get the same pretax contribution benefit, but the difference is that when you withdraw money to pay for qualified health insurance premiums or medical expenses (including nursing home stays and in-home care), it comes out tax-free. And the funds rollover from year to year, so you don't lose what you don't spend. Unfortunately, a lot of financial advisers fail to take the time to comb through your tax returns to check for tax efficiency. And tax efficiency is one area where a good financial adviser can be the most helpful. An adviser who only focuses on managing your portfolio may not have the expertise to accurately analyze your tax situation and understand how to maximize your income assets. A financial adviser who holds a CPA or CFP designation, on the other hand, would most likely be qualified to provide sound tax advice. Financial planner Charles Scott recently told USA Today that if the only tax advice your adviser gives is to put your money in tax-deferred investments such as an IRA or 401(k), you may want to get a second opinion. Because even though you'll be in a lower tax bracket when you retire than you are currently, there are so many other factors that must be considered. He advises that you diversify your tax load now and in the future.